This artist's impression shows the interior of the Schiaparelli entry, descent and landing demonstrator module. Schiaparelli, part of the ExoMars 2016 mission, was launched together with the Trace Gas Orbiter on 14 March 2016 and will arrive at the Red Planet in October. DREAMS consists of a suite of sensors to measure the local wind speed and direction (MetWind), humidity (DREAMS-H), pressure (DREAMS-P), atmospheric temperature close to the surface (MarsTem), the transparency of the atmosphere (Solar Irradiance Sensor, SIS), and atmospheric electric fields (Atmospheric Radiation and Electricity Sensor; MicroARES) at Mars. The payload will operate on the surface of Mars for 2–8 sols. In addition, there is an investigation known as AMELIA, for entry and descent science data collection using the spacecraft engineering sensors. 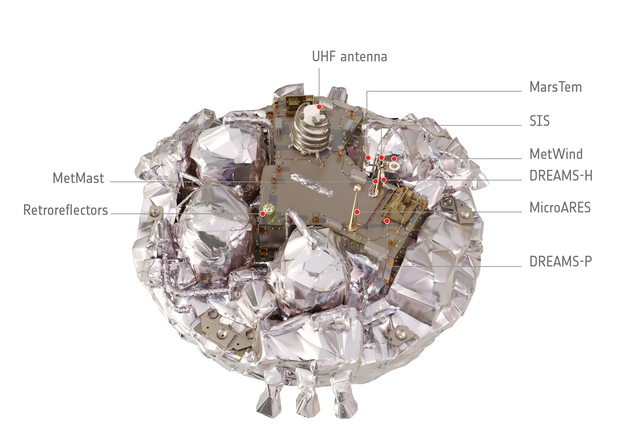 A separate instrumentation package, COMARS+, will monitor the heat flux on the back cover of Schiaparelli as it passes through the atmosphere. A compact array of laser retroreflectors, INRRI, is attached to the zenith-facing surface of Schiaparelli. This can be used as a target for Mars orbiters to laser-locate the module. A UHF antenna is used for communicating with the Trace Gas Orbiter.